In this section, you will find the most frequent questions about GO. If you have any, it might be answered here. Q: Does it cost anything to play the GameXN games? A: NO, all games in our collection are free to play. A: Please head over to secure.gamexn.net/SignUp. On this website you will have the option to sign up for an account. A message will be sent to the email address that you specify during registration. All you have to do is click on the link provided in that message and your registration is complete! IMPORTANT: Please keep in mind that this confirmation is an automated message. Check your spam mail folder as well, in case you do not receive the confirmation after a couple of minutes. Q: How can I add my GameXN friends? A: Please head over to secure.gamexn.net. Once you are signed in, you can check your account and check the option "Manage Friends" to add new usernames to your friends list. Once they accept your invitation, you will be able to see them online when they are using GO or the GameXN website. 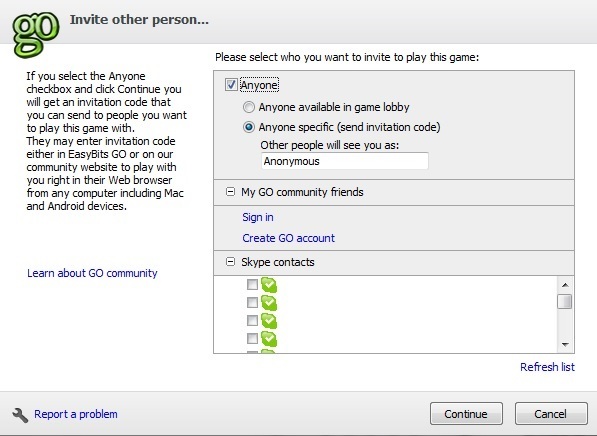 Q: Any precautions I need to take to ensure GO runs properly in my Skype? A: Make sure you have enough disk space to keep your computer fast enough to run all kinds of games; Update Skype to the very latest version; Make sure your firewall is allowing Skype and all related processes to connect to the internet; For online games, make sure you have the latest version of Flash. Q: I am trying to start a multiplayer game but the other player isn't joining in? A: The other player might have to download the game. This might take a minute or so for them to install and then start the game. Q: The game has started but the other player is not responding? A: The other player might be away or busy. If you are not on a call to them, try sending them a Skype chat message? You can also shake the game window to remind them it is their turn! Q: The other player closed the game. What's happened? A: If the other player is on a wireless connection, they might not have stable internet access. You will have to restart the game. A Skype voice call will also stop for the same reason. Also, if they are busy or have to work they might have just closed the game, sorry! Q: Someone I wish to play a game with is not online, how can I invite them? A: Go through the normal invite process then you will be given the option to send them a chat message invite. When they come online they will see your invite and can start to play. 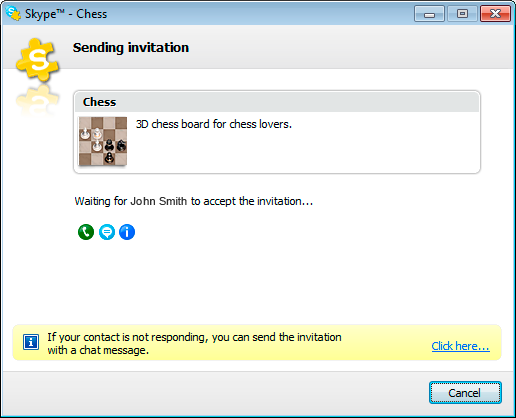 Q: Why can't I start a game with a Skype contact on Mac or iPhone? A: These games only work on Windows PCs at this time. Q: Which games are multiplayer? How many players can play? A: Next to each game in GameXN GO you will see a gray "person" icons. If it shows an additional two people icons and a "+", this means it will support multiplayer. Please choose "Play with others" to see the available multiplayer game selection. Q: How do I use the invitation codes? A: The code is generated by clicking on a game icon that supports multiplayer. As you choose the option to invite another person, simply check the box “Anyone” and then select “Anyone specific (send invitation code)”. Once the code is created and shown to you on the screen, simply copy it (or use the “Copy to clipboard” option) and paste it over any chat program or transmit it verbally over a phone call to the friend you wish to play with. 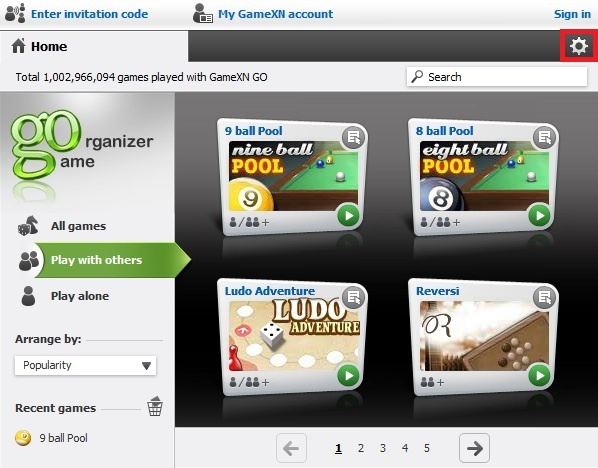 If you are on the receiving end of this invitation, simply click on the upper left tab of your GameXN GO main window and press “Enter Invitation Code”. Q: What other ways do I have to invite players? A: You may invite players by signing up for an account, for example. Once you are signed in, you can invite players from the GO Community Friends field. Another way to play online is using Skype. Make sure that GO is recognized as an authorized program by Skype. To do this, ensure that once you start GO, you are able to go into Skype and resolve the notification that warns you about GameXNGO.exe trying to access Skype. Alternatively, you may also add it under the tools menu by following the steps illustrated here. Q: I seem to have no sound on the games/ the graphics are stretched or strange, why? A: It is very likely that Flash is not working correctly or in need of some updates. To make sure you have the very latest version, please open Internet Explorer and use this url: get.adobe.com/flashplayer. Then follow all presented steps and you should be ready to use GO without any issues. Q: The games are not loading when I try to run them, why? A: You will need a steadily working internet connection to enjoy these games and play them online. Please make sure that your security software is not blocking GameXN GO on its firewall, and ensure that your connection is fully functional. If it’s dropping very often you might have trouble downloading the games. Q: Can I save my progress in any game? A: All level-based games (and some multiplayer ones) have an automatic save feature that is activated regularly. When you close the game window and go back to the game later, you should be sent back to the level you were in. If you close the program forcefully or if your computer shuts down unexpectedly, the save may be lost. Q: My friend has a version of GameXN GO that does not have invitation codes or user registration. Can I still play with him? A: We advise that both players have the current release. There are more options in the new available version and there might be some incompatibility issues when using any previous release. Please make sure you update regularly, as we have more features coming your way. Select the “Options” menu on the upper right corner and then choose “Check for Updates”. This process is automatic and will install the new version if required. This way you get the best content, as soon as it comes out! Q: If I am having trouble using GO and I can't find my answers here, what should I do? A: Contact us or use the Troubleshooting section under the Options tab of GO. Please send your queries in English, we will be glad to help you.